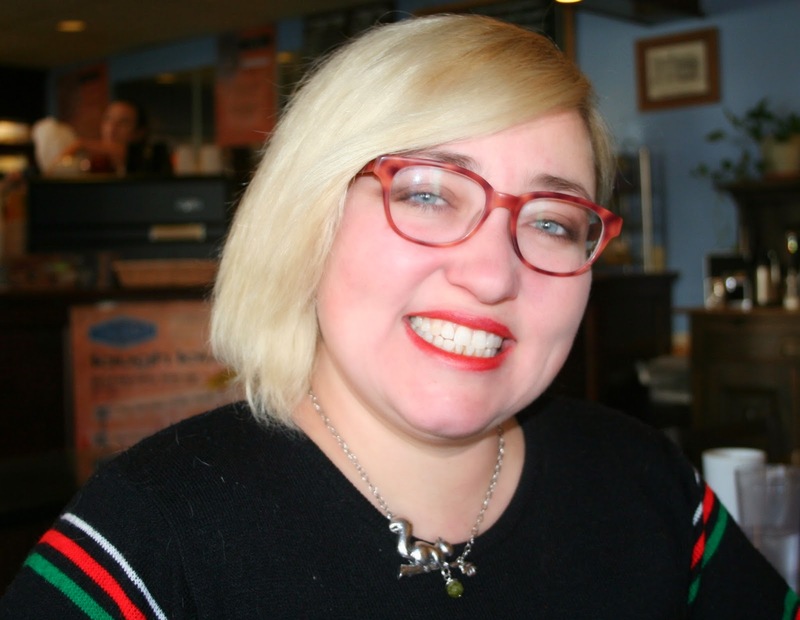 I’m really excited to share this interview with you because it’s one I actually got to do in person—Jeanette Powers is a poet right here in my hometown, Kansas City. She’s become a fixture in KC’s vibrant art and literary scene. She wears many hats: poet, spoken word performer, mathematician, painter and tireless promoter for the arts. She just released her second volume of poetry, the delightfully titled Earthworms & Stars. Her first volume of poetry, Absolute Futility, came out in 2012. I can’t wait to see her new work! Lauren: Tell us about your new work. Is it very different from Absolute Futility? Jeanette: It’s much shorter than my previous work and there are no older poems. Everything is new. Earthworms & Stars is a very experimental work. It’s all absurdity. There’s no narrative structure. I’ve had a lot of people congratulate me on getting a new book published, but I don’t measure success by it. Today, success for writers comes in many different forms. Maybe it’s publishing a book, but it could also be five million YouTube views. 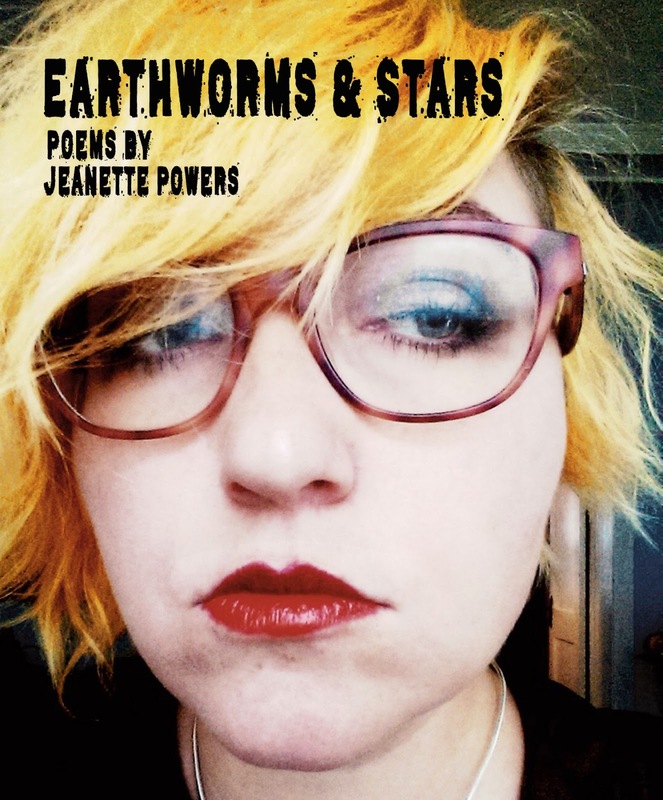 Lauren: Earthworms & Stars is part of a poetry series. Tell us about that. Jeanette: It’s the first of a project called Twelve Poets in Twelve Months to be released throughout 2015. It’s something that Jason Ryberg, who’s also a Kansas City poet and my best friend, and I came up with one day while we were getting drunk and hanging around the bookstore. I started going to Prospero’s [Bookstore] when I was nineteen. We thought we’d gather twelve poets who’ve been in the KC scene for the past twenty years and publish them as a series. We got a grant underwriter and raised enough money to publish the books through Spartan Press. We’ve almost got all twelve poets lined up for the year. All the book covers will be selfies. Their bio photos are going to be photo booth shots. Creativity is encouraged. But we wanted the books to reflect the ethic. Lauren: Do you think your love of absurdity ties into your mathematics background? Lauren: When did you become a poet? Jeanette: I began writing seriously when I was nine. I was terrible at it, but it was something I always wanted to do. I wanted to be an astronaut and a writer, a mathematician and a poet. Jeanette: That’s just a hobby. Lauren: Are you from KC originally? Jeanette: Yes, born and raised in KCK. But I love the whole city, both sides of the state line. I think when people ask which side of the state line you’re from, they’re really asking, ‘Are you from Johnson County?’ I’m not, I’m from the Dotte. I’m proud to be from there. We keep it real. Lauren: You’re on KC’s first ever slam team. What’s that like? Jeanette: It’s been a whirlwind. I haven’t had time to feel. We’ve been doing fundraising, producing, practicing. I’ll feel afterwards. But we’re not technically the first slam team—KC had one in 2004. They were certified and registered and everything, but for some reason it fell through. They ended up not going to nationals. We are the first KC slam team to actually compete at nationals, which will be held in Oakland, CA. So far, we’re doing great. We won both interstate competitions, one in Nebraska and one against an Arkansas team. Lauren: How did you get into slam poetry? Jeanette: Slam poetry is new for me. I only got into it in August 2014. Absolute Futility has no slam poetry pieces; Earthworms & Stars has four, including “Breaking Plates,” which I’ve been performing for the KC slam team. I love the performance aspect. I’m a total adrenaline junkie, which is ridiculous, because I suffer from panic disorder. I love riding the rip cord at Worlds of Fun. I want to go bungee jumping. I think it would be awesome to go zip lining through the jungle. But I’ve always performed. I think it’s just another part of communication. Public speaking never daunted me. I’ve always done gallery showings, and of course, I taught. Lauren: How has slam poetry affected your writing? Jeanette: With slam poetry, I’m working to expand my subject range. There’s a lot of political slam poetry out there, a lot of white guilt. Of course, I have to write about things I care about. I have feminist poems. It’s been an interesting discovery process. For a few months, I wrote nothing but slam poetry, now I’m back to absurdist. “Breaking Plates” is an absurdist poem. Lauren: Oh, I thought it was a feminist poem! Jeanette: A lot of people do. For me, it’s not. Remember, the refrain of the piece is, “Grandpa says,” a man. Most people need to assign some sort of meaning. For me, that poem is about destroying everything in your life once in a while. I think that’s how you grow. Most people aren’t willing to do it. I don’t know that many happy people. Lauren: Who are your favorite writers? Jeanette: My favorite writers are Margaret Atwood, Wislawa Szymborska and Rilke. I read a lot of poetry. It inspires me and broadens my ideas. I read and watch a lot of slam poetry. I love Dominique Christina and Buddy Wakefield. I also love Vincent van Gogh’s letters to Theo. Reading those changed my life, my entire ethic. I sleep with that book by my bed. Lauren: What are you reading right now? Jeanette: Right now, I’m reading Anis Mojgani’s poetry and the Game of Thrones series. It’s awesome. I don’t own a TV, so pulp fiction is my entertainment. In addition to poetry, I read a lot of nonfiction. I’ve started a new routine. I’m hoping to gain more discipline. My routine is working out and reading. I have a bone condition. I’m unable to absorb Vitamin D. I’ve had seventeen broken bones and other minor traumas. There’s no medication for it. My only treatment option is to lift weights. So I’m doing that. I’m also trying to read more. I take hour-long baths and read. It’s joyful. So far, I’ve read five books in the last two months. Jeanette: No, that’s because I’m a masochist. I punish myself. I also have a tattoo on my calf of a shark eating its own tail. I have a Pokemon character that my daughter designed. There’s a bunch more, lots of ink. Lauren: What does your writing process look like? Jeanette: For the first nineteen years, I always wrote in notebooks. I wrote so slow, there were no drafts. I wouldn’t put a line down until I knew exactly what I wanted to say. Now I just write my ideas in a notebook first—flooding the page with ideas. I rip them out, type them up on the computer and arrange them. Then I print them and start to memorize. Since slam poetry and spoken word performances are better memorized, it has really changed the way I write. Something may sound great on the page, but that doesn’t mean it works in a performance. So I alter it to facilitate memorization and performance—I give myself triggers to remember the next line. Sometimes, a poem will change on-stage just for one night, for that particular audience. The poems are never finished. Lauren: You’ve been writing since you were nine. How do you feel your work has changed over the years? Jeanette: It’s definitely evolved. It’s less autobiographical, less obscure. For the most part, my poems are shorter now. My poetry is more deliberate. I feel like I actually have something to say. I didn’t start going to readings until I was eighteen. I had years of writing under my belt, but I didn’t understand that I wasn’t communicating anything. It wasn’t until I went to a reading and heard real poets that realized how much I sucked. I wrote a poem called, “Little Jenny Sue,” which was advice to my younger self. I’ve changed a lot since then. I attained some self-recognition. Lauren: What would you say are the recurring themes in your work? Jeanette: Mythology, persona poems, absurdity. No love poems. Lauren: When you’re not writing and performing, you work at the Uptown Arts Bar. What do you do there? Jeanette: I’m the general manager and booking agent. I’ve been there since October 2013. I’m a total workaholic. Lauren: Besides the slam team, what other projects do you have going on? Jeanette: I’m the producer at Poetic Underground. I’ve been doing that since July 2013. Basically, I help hold it all together, all the behind-the-scenes stuff, bringing big acts to KC. Lauren: I feel like most artists have to have a lot of jobs. What else have you done? Jeanette: I’ve been a server, a tutor, a bartender. I also taught grad level physics at KU. Jeanette: Again, I’m a workaholic. It’s a coping mechanism. In some ways, it’s no different than drinking. It’s a negative obsession. Lauren: What are your plans now? Jeanette: A dream I have right now is to bring big-name poets to Kansas City. We’re bringing Pages Matam in this month. I hope one day to bring in someone like Margaret Atwood. But next year, I probably won’t try to get on the slam team. I need to take some time off for my own mental well-being. I’m setting boundaries—not to limit myself, but to see what all I can be. Thanks, Jeanette! Best of luck with the new work and the slam competition! As always, please feel free to leave questions/comments below. Jeanette Powers is a poet painter who fancies herself immune to the drudgeries of adult life. She can be found living as performance art in Kansas City. She wears broken shoes and collects questionable artifacts from the city life around her. Her resume may be quite astonishing, math and physics degrees, poetry lecturer and performer, numerous art openings, broke her arm while dancing, winner of the Curator's Award at the Fermi Lab's ART Gallery in 2010, winner of the medal for the Best Mathematician in her graduating class in college and notorious bed hopper; but that is all less interesting than spending the evening with her. To purchase Absolute Futility, click here.